Ever more people are discovering the joys of getting out and exploring nature and the joys of hiking in the mountains together with like-minded people. Summit touring festivals are here to stay, and Norway offers a variety of them. Festival. The word itself evokes associations with a warm summer day and the foehn wind blowing against sparsely dressed bodies, as well as something refreshing in a glass and music that titillates the ears and soul. For a growing number of Norwegians — and visitors to Norway – it is a very different kind of festival that will likely be this year's highlight. And here, the main elements are quite different: Snow, sweat and crystal clear air. And, not least, the insane rush you get when heading down a mountainside. Brynjar Åmot of the sports and outdoor magazine Fri Flyt knows a bit about summit touring. 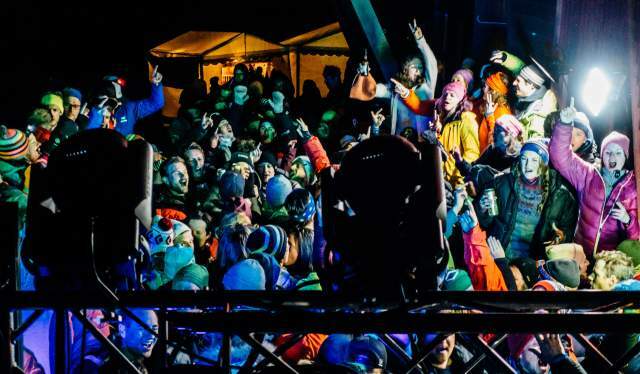 The magazine organizes three tours during the season – High Camp Turtagrø, High Camp Sunnmøre and High Camp Nord – and Åmot is the project manager and festival director for all of these. "A summit tour – in the winter – means that you walk up the side of a mountain with climbing skins fastened to your skis, and then ski down it without the skins. This has become very popular over the past ten years, in a totally different way than it had been before." The growing popularity of the phenomenon is largely due to better organization of something which at times can be a demanding undertaking. "Norwegians have always gone hiking in the summer, but it has been more difficult to do in the winter. This has to do with the equipment, information and knowledge. Before, you would have to head to a specialist store to find the right equipment, but all the Norwegian sports chains have eventually got hold of everything needed for a summit tour," says Brynjar Åmot. He pulls out a splitboard, which is an innovation that many enthusiasts use for going on a summit tour. "It's a snowboard that you can separate into two ski-like parts. This enables you to climb up the mountain on skis and then put them back together again as a snowboard for the trip down. "The Woodstock of summit touring festivals"
Fri Flyt has compiled a handy list of Norwegian summit touring festivals for the first half of 2018 here. Brynjar Åmot is unencumbered enough to mention one of his own festivals when asked to name this season&apos;s summit touring highlights. "High Camp Turtagrø was the first of the Norwegian summit touring festivals. We started in 2001. We have been called the &apos;Woodstock of the summit touring festivals&apos;, and people from Canada have told us that they have not seen anything like it anywhere in the world." However, he also gives praise to a relatively new player among the ever-increasing number of festivals. "Lom Ski Festival is an excellent alternative. Most of the summit touring festivals take place relatively late in the season - typically from March and onwards - while Lom starts their season in November. This means that the amount of snow can present a challenge, but it hasn&apos;t been a problem for the three years they have been operating." Knowledge and equipment are a prerequisite for undertaking a summit tour in order to keep life and limb intact. Åmot has noticed that there are varying degrees of both of these essentials among the festival participants. "Some people show up with nothing more than downhill skis. It would be quite a feat to herringbone it up a mountainside with that kind of skis," he says. Courses, seminars and guided hikes in the mountains are thus essential components at most summit touring festivals. Avalanche forecasts and weather forecasts are necessary tools as well. 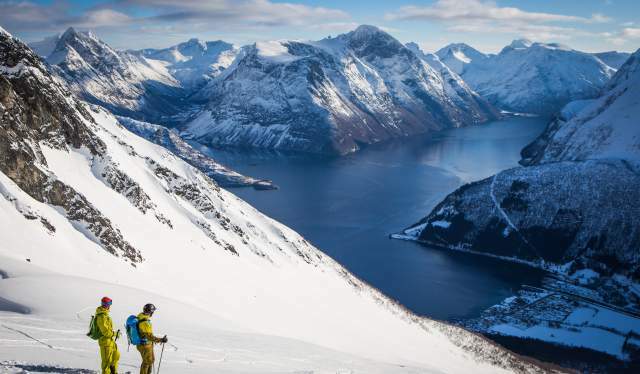 But, of equal importance to the overall experience is everything else that's going on outside the newly-trodden ski tracks," according to Åmot. "The social aspect is central, and many of the elements from 'ordinary' festivals are present, including concerts, stand-up comedy and quizzes."